Missies by Django & Juliette is a chic closed-toe high heel. 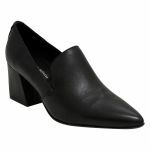 You would wear Missies to work or even to an evening event. 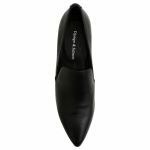 Missies has a long pointed toe with ample foot padding. Missies is made from textured black leather that is soft and will mould to the shape of your foot. 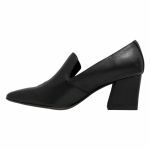 Missies has a rectangularly shaped block heel providing you with balance and stability all throughout the night. 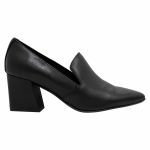 Missies has an unlined back of heel to prevent rubbing and blisters. Prolong the life of the leather by using Waproo Water & Stain Protector before wear and using Waproo Zorbel Leather Conditioner when the leather needs replenishing. Please note: As leather is a natural product it differs from hide to hide. Natural variations such as texture change, scars, blemishes, dents, scratches and markings are not considered as faults but as part of the uniqueness of leather. These qualities are all telling factors of genuine natural leather rather than a default in the product.